Originally created for use with Landiin's eXtreme UI but compatable with all the fetish based ui's out there. 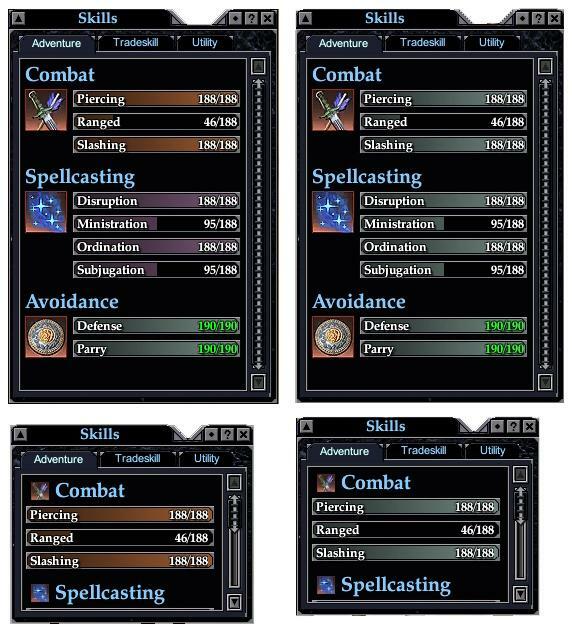 The screenshot shows the windows with fetish widgets from the goth theme (actual look will depend on what theme you use). All the windows are horizontally and vertically adjustable and minimizable. Two are Normal sized with icons to left of the bars one is full standard color range other is all one color. The two minimalist versions have a smaller minimum size. The icons were moved to to the titles to save room. One has full color range and other is all one color bars. The solid color bar windows are easily changed to any hex code color by editing the xml in notepad or whatever and search for #748C84 replace with any hex color you like. Just pick the window you prefer and copy it to your custom ui directory. 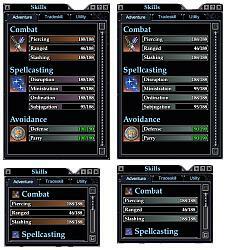 eq2ui_mainhud_skills.xml was the only file modified in this customization. PM me if you have any problems with this mod and I'll be glad to help.